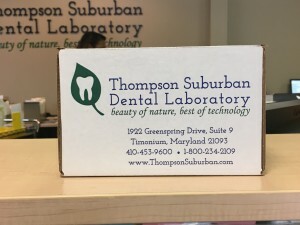 At Thompson Suburban Dental Lab, we make it easy for you to package and send your case. We provide everything you need, from boxes to bubble wrap and shipping labels! The only thing we ask is for you to take care when packaging any small or fragile items to make sure we get them intact. Follow the steps below to send your case to our lab. Download, print and fill out the prescription form. Download here. 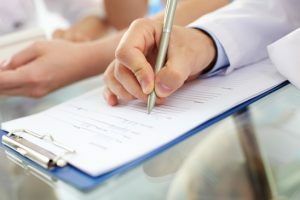 Please include all necessary information including patient’s name and date, case specification, shade and stump shade if required, and design. If you haven’t already, contact us to order your welcome packet that includes shipping boxes, UPS labels and everything you need to package your case. It is very important that you properly package all items! Please put all small items such as implant parts and bites in separate bags or boxes. In order to help us keep our laboratory running efficiently, please help us by enclosing all necessary materials, including implant components and completed scripts. Wrap all models in bubble wrap. Place foam cushion on bottom of box especially with UPS packages. Your care will ensure that we receive everything intact. When you are done packaging, seal box securely. 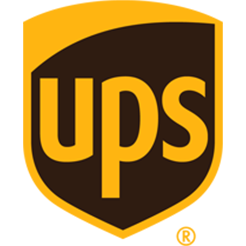 If you are outside of Baltimore/Washington area, use our prepaid labels for UPS and drop off your case package at your closest UPS location. Contact us to order your labels. TSDL provides reliable and prompt pickup and delivery services to all of our clients in the Baltimore/Washington areas! We are able to provide either our own or a private courier service. Please call the lab for more information on how we may serve you best or contact us online to schedule pickup.